HAVE YOU ACTED ON YOUR PURPOSE? PURPOSE, is a very large subject to tackle. That is mainly due to the fact that it affects every aspect of our daily lives. It is also something that people often struggle with. In some instances people have a difficult time discovering their PURPOSE. Then there are those who know what their PURPOSE is and have trouble believing in it. You see, it is one thing to know what your PURPOSE is and quite another thing to act on it. To do that takes COURAGE. It requires a strength that most people do not even realize they even have. And that is because when you are living in your PURPOSE it unveils itself as being EASY. It appears EASY because it is the very thing that YOU were meant to do. Other people may tell you many times over that THEY could never do what you do. Maybe it is due to the fact that what you are doing requires great PATIENCE. Or it may involve some other attributes that most people do not possess. In the process of living your PURPOSE you will do things that you could not have imagined yourself doing. Nearly 20 years ago on a bright September morning, my daughter entered the dance studio for the very first time. Her dance teacher informed me that she had leadership qualities. As the years went on Jasmine was in every form of dance she could be in. We all thought for certain that one day we would see her PERFORMING somewhere. Along the way she balked at the thought of performing for a living. As time went on her true PURPOSE revealed itself. The GIFT she was given had little to do with her PERSONAL performance as a dancer. Her true gift was found in her ability to TEACH others. She is filled with an overabundance of patience with children of many ages. This year her teaching has reached a new level. 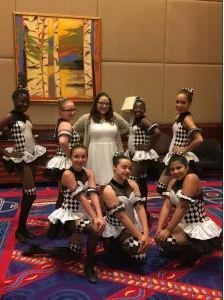 She took a group of dancers (pictured above) to the national level. They came in the top ten overall. Quite an accomplishment for both TEACHER and STUDENTS alike. Her future still wanes ahead of her and it is unknown how many children she will eventually reach. But for now and this past season,she is on track to fulfilling her PURPOSE!